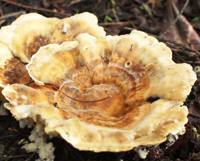 Trametes ochracea grows on standing and fallen dead wood of deciduous trees, in particular beeches and oaks. Unlike the closely-related Turkeytail Trametes versicolor, which is tremendously variable in colour, Trametes ochracea is much more consistent in its general appearance; however, pale forms of Turkeytail could be confused with this species. They are readily separable by measuring spore size, however. 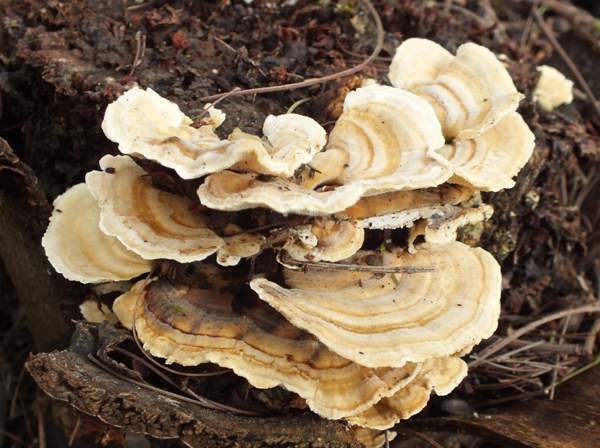 Far less common in Britain and Ireland than other Trametes species such as Trametes gibbosa and Trametes versicolor, Trametes ochracea occurs also throughout Britain, Ireland and mainland Europe, from northern Scandinavia right down to the Mediterranean region. Originally described in 1794 by Christiaan Hendrik Persoon, who gave it the binomial scientific name Boletus ochraceus, this species acquired its currently accepted scientific name in 1987 in a publication by American mycologist Robert Lee Gilbertson (1925 - 2011) and Norwegian mycologist Leif Randulff Ryvarden (b. 1935). Synonyms of Trametes ochracea include Boletus multicolor Schaeff., Boletus ochraceus Pers., Boletus zonatus Nees, Polyporus zonatus (Nees) Fr., Polystictus zonatus (Nees) Fr., Coriolus zonatus (Nees) Quél., Trametes zonata (Nees) Pilát, Trametes zonatella Ryvarden, and Trametes multicolor (Schaeff.) Jülich. Trametes, the genus name, comes from the prefix tram- meaning thin - implying that fruitbodies of fungi in this genus are thin in section. The specific epithet ochracea refers to the typically ochre colouring of the upper surface of the fruitbodies of this fungus. Individual brackets and semicircular or shell shaped, finely downy or hairy on the upper suface and usually broadly attached to the substrate. Occasionally, as seen on the left, rosette forms are produced on the tops of stumps or other horizontal surfaces. Caps are 1.5 to 5cm across, and they frequently overlap in layers to form much larger compound fruiting masses. While the upper surface comprises concentric zones of various shades of brown, ochre and orange, the fertile underside is creamy ochre and it is covered in mainly roundish pores 1 to 4mm deep spaced at 3 to 4 pores per mm. 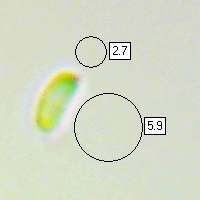 The pore surface does not stain significantly when it is bruised. 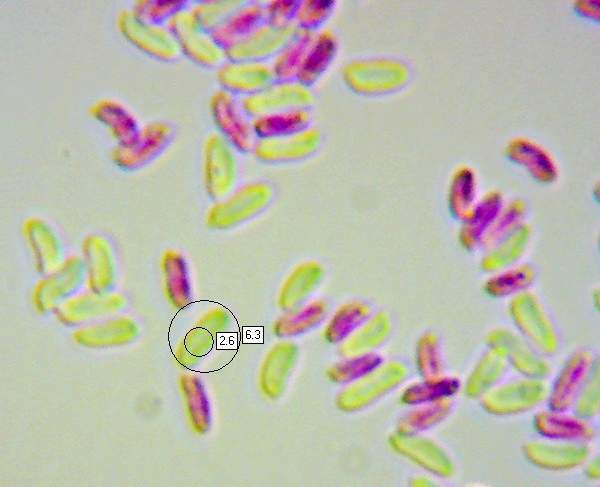 Curved cylindrical (allantoid, or sausage-shaped), smooth, 5.5-7.5 x 2.5-3µm (significantly larger than the spores of Trametes versicolor); inamyloid. No distinctive smell or taste. This thin, leathery fungus attacks mainly dead wood, fallen or standing. 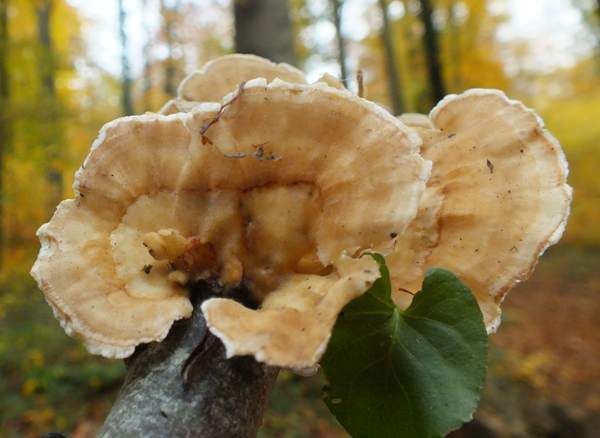 It is found on hardwoods such as beech and oak. These annual bracket fungi are slow to decay and so they can be found all the year round. Visually, they are at their best in autumn and winter, which is when they release their spores. Trametes versicolor is much more common and widespread; it is usually darker with slightly smaller pores, but it can be reliably separated from Trametes ochracea by its noticeably smaller spore dimensions. Trametes suaveolens is a much paler bracket and does not usually grow in such dense overlapping tiers as Trametes ochracea and Trametes versicolor. 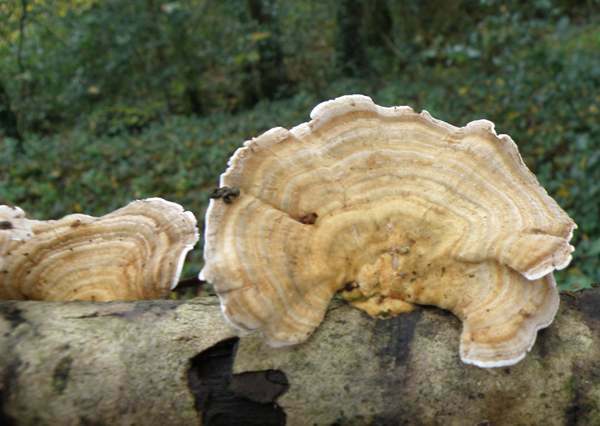 Several corticioid fungi (crusts) can produce zonate fruitbodies; among them are Stereum species, which differ from Trametes in having smooth spore-bearing undersides rather than having pores. See Stereum subtomentosum for example. These bracket fungi are far too tough to be considered edible. Ryvarden L. (1991). 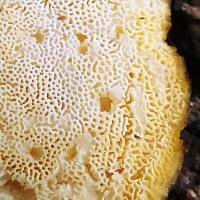 Genera of polypores: Nomenclature and taxonomy. Syn. Fung. 5: 1–363. Taxonomic history and synonym information on these pages is drawn from many sources including the BMS GB Checklist of Fungi and (for basidiomycetes) on Kew's Checklist of the British & Irish Basidiomycota.